While couch-surfing yesterday afternoon I came across the U.S. Bank NBC Sports Report with Liam McHugh. First up on the highlight reel was the Chicago Blackhawks continuing their record, non-losing streak to begin an NHL season as they bested the Detroit Red Wings in overtime 2-1. Next up came Lebron James leading the Miami Heat over the New York Knicks, 99-93, in Madison Square Garden. That was followed by Tottenham over Arsenal 2-1 in Premier League play in England. 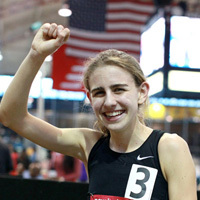 Finally, McHugh teed up the feel-good story of Mary Cain, the 16 year-old phenom out of Bronxville, New York capturing the mile at the U.S. Indoor Track & Field Championships in Albuquerque in 5:05.68. “Look for her in three years in Rio,” McHugh said in closing. Going back to 1967 when Doris Brown won the first of four U.S. indoor mile titles in 4:43.3, there has never been a single U.S. indoor mile/1500m title won in such a pedestrian time. In fact, the slowest winning time in the previous 46 years was 4:59.3 run by the Toronto Olympic Club’s Abby Hoffman in 1969 when she bested Shalane Flanagan’s mom, Cheryl Bridges (5:07.0). Yet, it mattered not to NBC Sports that Cain’s time was the slowest in modern U.S. indoor history, or that it was nowhere near here best high school record 4:28.25 that she ran at the Armory in New York at the 106th Millrose Games in February behind Canada’s Sheila Reid. In this day and age when track and field has been all but dry-docked from the sporting mainstream, the fact that a runner made it to a major network’s highlight package goes to show what a winning personality can generate. Yes, Cain has been setting records left and right all indoor season long. Yes, her coach from afar Alberto Salazar has been forthrightly touting her excellence and potential throughout — though restricting her media access. And, yes, Cain’s race tactics and final 400 meters in Albuquerque, 58.61, showcased unusual savvy and a quick-strike capability which confirms Coach Salazar’s heady expectations. But what has captured the public’s imagination is the personality of Mary Cain, her self-effacing ease in the brightest of lights in front of thousands of spectators as if she were just chatting in the hallways of school with her friends. The message should be clear to USATF and any others who want to put on a track meet. Yes, the general public has long-since lost interest in track and field. They haven’t a clue as to what constitutes a good time or a mediocre one. So who cares about a 5:05.68 to win the national indoor championship mile, or an opening 400 in 83-seconds? Yes, the field was weak and the time was slow, but by the same token, what people do care about and relate to is a compelling personality and a stirring competition, regardless of the finishing time. Let’s hope the new leadership in Indy takes in that lesson, and can find a way to get the best runners in the nation to take part in their national championships. Who knows, we might be on to something. Thought-provoking piece as usual Toni – Competition over time (or height or distance) chasings now there’s a novel thought for track & field for some, particularly in the media. Perhaps the propinquity on the London Olympics will keep in mind for the general media personnel and paying spectator punters that track & field, like any sport, is about competition, competition and, oh, yes, competition. WRs are merely outcomes of the athletes focusing on the intensity of the internal processes that drive competition – unless we’re in the artificial world of ‘paced races’ With these we have dumbed down the essence of competition and perhaps, possibly, we need to evaluate the use of pacers or ‘rabbits’ in televised meets less we become instigators of our own demise. Now, we move on to personalities and their value……. Records should be the cherry atop the cake of competition, not the meal in itself. As you point out, since we have been marketing time for the last 30 years rather than competition, the state of the sport has declined markedly. Perhaps when words like propinquity regain fashion, athletics will as well. All the best and thanks for chiming in.